I admit it; I’m a grumpy old man always complaining about kids doing this and that. Yes, the truth is that I’m just jealous that my 12-year-old can read War and Peace in the time it takes me to text a message and when he can tear himself away from i-this, i-that, I say ‘Please can you do some homework,” and get a stare that resembles Celtic and Rangers fans after a particularly feisty Glasgow derby. But there is one thing that does get on my nerves and that is kids, and I mean young kids, who are literally glued to their phones. I hear stories from teacher friends who complain that kids in Year 7 are constantly messaging, texting, Facebooking (the verb will be in common use within five years), anything except LEARNing. Step onto any bus and you are confronted by a raft of hand-held devices held by kids as young as seven. But of course there is a worrying side to this seemingly inescapable march to technological meltdown. In my day, bullying meant a good hiding in the playground; today it’s much more sophisticated with texting replacing the the boot and with parents seemingly in much less control of their youngsters than ever before it came as a pleasant relief to see this product hit the market this week. 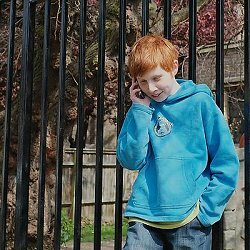 Bemilo represents the first time a phone company has addressed the problem of our children’s obsession with the mobile phone. But the really good thing about Bemilo is that the concept is about enabling rather than punishing children. The company is to be congratulated for helping children use their phones safely with the fall-back of their parents monitoring and controlling their usage in case they run into problems. On this piece on Radio 4’s You and Yours programme some older sounding kids objected to their parents being able to ‘snoop’ on them. But I applaud this company for caring about kids who can’t speak up for themselves, who need a phone to let mum and dad know where they are and who can be part of the technological zeitgeist without worrying about the consequences. Anything that enhances safety of children gets our approval; this product looks like the perfect way for a parent of a nagging child to say ‘yes’ knowing that the child will be protected.